GUIDED FISHING IN THE ADIRONDACKS. FLOATING FUN! GUIDE DAY OUT! Vince Wilcox’s has been a Signature tier for Idylwilde Flies since 2004 and has had over 30 patterns tied and sold commercially around North America. His flies have also been featured in books such as Dave Klausmeyer’s 501Favorite Fly Tying Tips and The Master’s Fly Box, Todd Hosman’s Colorado Trout Flies, Randall Kauffman’s Fly Patterns and Ben Roman’s Montana’s Best Fly Fishing. In addition to these books Vince’s flies have also been featured in a host of publications and he has written for Eastern Fly Fishing, Southwest Fly Fishing, Fly Fisherman, and American Angler and is a contributing writer for Fly Tyer magazine. His first in a series of books from Lyons Press “Vince Wilcox’s Naturally Artificial Signature Flies” was released in April 2012. Geoff Mueller of The Drake writes "Vince Wilcox is one of contemporary flytying’s leading innovators. His signature trout patterns break the status quo because they are originals, period, invented and tested by the man behind the vise, and this book. From midges and micro mays on technical Western tailwaters, to fishing J.C. Specials on unnamed rivulets in New York’s vast Adirondack State Park, the flies featured here regularly stick selective fish. Read Wilcox’s articulate descriptions, practice expert step-by-step techniques, and unlock the recipes that tap into fish instinct and angler curiosity better than most. Then go fish the bugs and see for yourself.” Look for it in Amazon and premium fly shops everywhere. As a production fly tier he has tied hundreds of thousands of flies and when he’s not busy writing, running his on-line store and tying flies, he is guiding in Colorado, Wyoming and primarily on his northern Adirondack streams. "I am not one of those fly tiers or fishermen that claim to have been fly fishing since I was born; however I did begin at the age of four, my dad would cast out and hook the fish for me and I would pull them in. By the ripe age of seven I was completing the process on my own throughout the Adirondack Mountains with my dad and his friends. As I got a little older, eleven actually, I would take my BMX bike, the #44 placed with electrical tape to the front yellow racing shield, rod across the handle bars and one little box of flies down to the Saranac river. No waders, no boots, just Nike canvas shoes and a pair of Levi’s which meant I would come home soaking wet, much to my mothers displeasure. On a good day I could be in for a free coke and some fries right outside the overhanging restaurant windows at Dr. Y's! In 1995 while living in North Carolina, I attended a friends wedding in Estes Park, CO and literally decided that day to move to Colorado. I bought a new Ford ranger, packed it up and moved out to Ft. Collins, CO two months later. I spent over twelve years hiking and fishing the Rocky Mountains from British Columbia and Alberta in Canada to Wyoming, Utah, Montana, New Mexico, Idaho, South Dakota and of course Colorado." In 2007 My wife and I moved back home to Rainbow Lake and opened Wiley's Flies, the best stocked fly shop in the Adirondacks! Bill Hickey grew up in Stillwater, NY fishing the Hudson for Bass, Carp and whatever else swims. Bill began his fly fishing ventures over twenty years ago on the Battenkill River and hasn't stopped. Since that time he has spent a great deal of his time in the Adirondacks fishing the West Branch of the Ausable and surrounding areas. Although he only began guiding in 2009, he is well versed in streamside entomology and an excellent teacher in his own right. Experienced with all nymphing techniques and has a soft spot for fishing the technical flats during the spinner falls.When he isn't on the water he is employed as a full time firefighter for Saratoga Springs. he also has a custom fly rod company, W. Jude Fly Rods, which can be purchased here at the shop. For more information on his rod offerings see his website http://wjudeflyrodcompany.com/home.html If he isn't fishing in and around the Adirondacks he spends a majority of his time fishing the Farmington, Deerfield and Battenkill along with others we can not name. 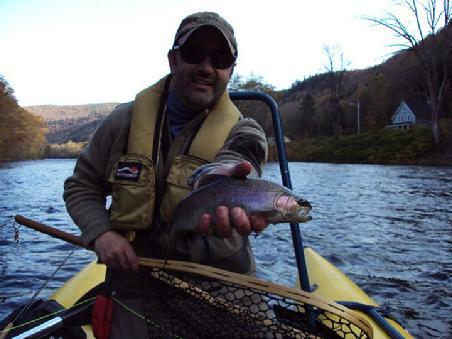 Skilled in the use of floating pontoon boats he is able to guide clients on float trips down several fantastic rivers, including the Deerfield outside of Charlemont, MA. Tom Graham with a nice Adirondack Bass. Tom grew up on the streams of Pennsylvania cahsing carp, stripers and trout at the NJ shore house. He came to the Adirondacks to attend Paul Smith's College in 2007 and graduated in May of 2011 with a degree in Fisheries Science. Tom soon became a shop rat and has proven himself on the water and off and has quickly become a beast on the sticks (rowing our float boats) and a masterful guide and fly tier. He does it all for us from tiny trout streams to big river floats for pike, bass and musky to fishing adventures on the Saranac Lake chain in our 22' pontoon boat. In the winter time Tom heads up our Ice Fishing trips and works with another one of our guides producing maple syrup at the finest sugar makers in the land, South Meadow Farms. He has also worked as a diver removing invasives from our water ways and restoring and building fire towers, yes I said fire towers! He can often be found hanging out and helping out at the shop. Living his dream here in the Adirondacks, fishing! Drew Price and I have connections that go back into the early 90's for our shared love of the best jam band on the planet, the Ominous Seapods! He took his love of the band so far as to have the band logo permanently tatoo'ed to his body! The fishing connection came more recently as the band re-united so did we! Here are his own words to describe what he offers on the other side of the lake for us, Lake Champlain that is! I often refer to myself as a “fish geek”. I love fish- their behavior, their environments, how they look and of course fly fishing for them. I grew up playing along (and in) a couple of small trout streams in Northern New York. I spend a lot of time crawling around trout streams but I am just as comfortable in my canoes in big rivers or wetland areas. I chase everything from sunfish to muskies to king salmon to brook trout. If I have a soft spot for any group of fish it is the oddballs that most people don't think of as fly rod targets- bowfin, longnose gar, freshwater drum (sheephead), suckers and carp. At heart I am a sight fisherman. I really like to hunt fish, stalk them quietly, get myself into a good position to cast to my target, cast without spooking them, fooling them with a fly I tied then getting a great picture before I release them to get bigger! To me this is the soul of fly fishing. I really enjoy teaching these techniques to my clients. I really enjoy the chance to teach others how to catch non traditional fish on a fly but I do love to teach anyone about fly fishing and fish. Lake Champlain is the perfect place to get people into their first fly rod carp, bowfin or gar! Mike Gray spent his early childhood years moving all over the country, when it came time to decide what to study in college, fish were at the top of the list. Most folks go to college with some sort of idea of what they want to do for a career. Not Mike. He spent three quarters of a decade studying fish, aquatic invertebrates because he wanted to learn how to catch more fish! Mike's motto is: know thy quarry. After earning a Bachelor's degree in Fisheries and Aquaculture from SUNY Cobleskill, and a Master's degree in Biology with a focus on Stream Ecology and Aquatic Invasive Species from the SUNY Oneonta, Mike took a job as a fisheries biologist, managing the fisheries and supervising wildlife research at Fort Drum, a 75,000 acre Army installation near Watertown, NY. It was while working at Ft. Drum, that the most unusual event occurred: he met an Adirondack sugarmaker's daughter. When the opportunity presented itself, Mike quit his hard-earned biologist job and packed his bags to move to the Adirondacks to make maple syrup and work as a flyfishing guide. Since 2006, Mike has spent the majority of his guiding on the West Branch of the Ausable and other much smaller, more intimate brook trout streams in the High Peaks region, with a bit of pond fishing thrown in for good measure. In the Summer of 2011 he spent virtually the entire Summer chasing pike and musky. 2012 finds Mike back in the guiding seat. He specializes in all levels of flyfishing instruction, river trout fishing, small stream trout fishing, and warmwater toothy critters.